Tuition and fishing experiences are done either on a half day or full day/s session/s, on the various private beats I use on the lower/middle river Eden. If there are two people (the day rate cost is split, half each), only one may be in the water at any time unless we purchase a second permit (optional @ £50). This works well because you will learn as much by watching and doing other things while resting. There is a £50 deposit payable per person to secure a date in the diary which is non-refundable to cover any fishing permits. Everything is included in the cost like the equipment, coffee, photos, tuition and one permit (excluding E.A rod license if you want to fish). I can also supply quality equipment for you to use (waders, tackle and safety gear). If unfishable due to a flood, severe weather conditions or there is a disaster, the day will be cancelled and re-scheduled or if agreeable just casting tuition. If there are two or more anglers for the scheduled day and extra permits have been purchased, the cost of those permits will be lost (this is standard all over the UK) as the fishing’s have to be paid for in advance to the owners of the beat, I will not charge for my time that day. Safety is of paramount importance, and although accidents do sometimes happen in life, I will ensure to the best of my ability and experience that there are no disasters. Please do let me know if there are any things I should know about before you arrive, ie: medical/ability. It is advisable to book early on in the year as possible, the river Eden and the experience/tuition is very popular during spring, summer and autumn. 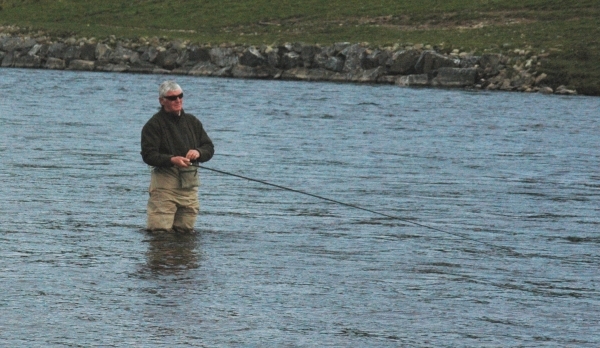 Did you know you can practice salmon or trout casting on the river out of season, as long as you have a piece of wool instead of a fly on your leader? (and permission of course). Get your casting skills up to speed for when the seasons starts.